Saying a former Gainesville youth minister’s breach of trust will have a lifelong impact on two young men, a judge sentenced the convicted child molester to 18 years in prison Tuesday. hearing in Hall County Superior Court. Phillip Glenn Terrell, 38, pleaded guilty Tuesday to molesting two teenage boys at the Emmanuel Baptist Church on Atlanta Highway in 2006. Terrell was the leader of the small congregation’s youth group. The congregation has since moved from the brick church on Atlanta Highway and changed its name. Tuesday’s plea hearing marked the second time Terrell has pleaded guilty to child molestation. Last month Terrell pleaded guilty in Forsyth County Superior Court to molesting a teenage boy who was also a victim in the Hall County case and was sentenced to 15 years in prison. 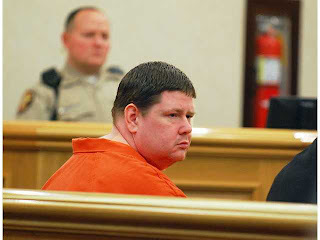 The Forsyth County sentence will run concurrent with the Hall County sentence, meaning Terrell will serve a total of 18 years in prison, with credit for three years spent in jail awaiting trial. He also must serve 32 years on probation after his release from prison, with more than 20 restrictions that include no contact with minors. The mother of one of the victims, who was 13 when the molestation occurred, told Terrell in court Tuesday that he used his position to “emotionally, physically and spiritually” molest her child. “You almost destroyed his relationship with God,” the woman said. Terrell was hired by Emmanuel Baptist in 2003, two years after he was acquitted of child molestation in Paulding County. Church officials were unaware that Terrell had been charged with molesting a boy in 2001 while working as a juvenile detention center guard. A judge found Terrell not guilty of that charge in a bench trial. Emmanuel Baptist Church was formed in Gainesville in 1938 and at its peak had about 400 members. By the time Terrell came on board to run youth programs, regular Sunday attendance was about 50 or 60 people. Nearly three years after Terrell’s arrest, the members of Emmanuel Baptist moved to a storefront and changed the name of the church to Heritage Fellowship. The old brick church was leased to Heart Outreach Ministries. Terrell addressed the court, saying he did not dispute the charges. Hall County Superior Court Chief Judge C. Andrew Fuller told the two victims, now young men, that if not for them bravely stepping forward, Terrell’s conduct likely would have continued. “Our society admires people like you who have the strength and the intestinal fortitude to take that stand,” Fuller said.